As part of a major redevelopment of the Bristol Royal Infirmary, Willis Newson commissioned a series of integrated artworks for the space on behalf of University Hospitals Bristol NHS Foundation Trust. The artworks forge connections between the hospital and its local community, create inspiring and welcoming patient and staff environments and solve some of the building’s practical challenges. 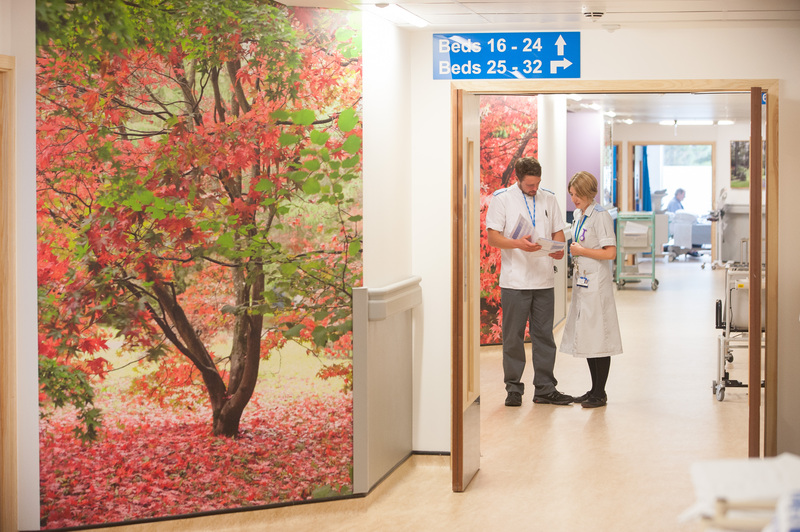 Award-winning photographer Simon Roberts involved patients, staff and the local community in the development of his project to create photographic artworks for wards and departments across 7 floors of the new BRI ward block. He even requested the public submit images of their favourite Bristol locations, which resulted in thousands of people responding. Through a process of widespread community and staff involvement Simon developed a series of photographs and collaged montages that have been installed as wall vinyls, printed ceiling tiles and framed images in various spaces across the site. The images, which reflect the city’s culture, landscape and history, have helped give the building a unique identity, prompted conversations and made the hospital environment feel more welcoming and less clinical. Designers Studio Weave created an acoustic baffling sculpture called “Terrell” (see above). 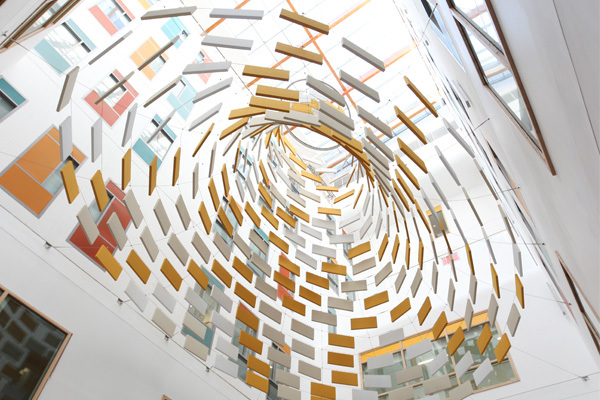 This large-scale artwork creates a visual centrepiece to the atrium of the 7 storey ward block. The innovative sculpture absorbs noise from the activity on the ground level, whilst providing additional privacy for patients by shielding sightlines from the upper floors. The sculpture is inspired by the Terrell Rope Works, a family-run rope and twine business whose house used to sit on the hospital site. The design takes its cue from the dynamic, splaying strands of the rope industry. 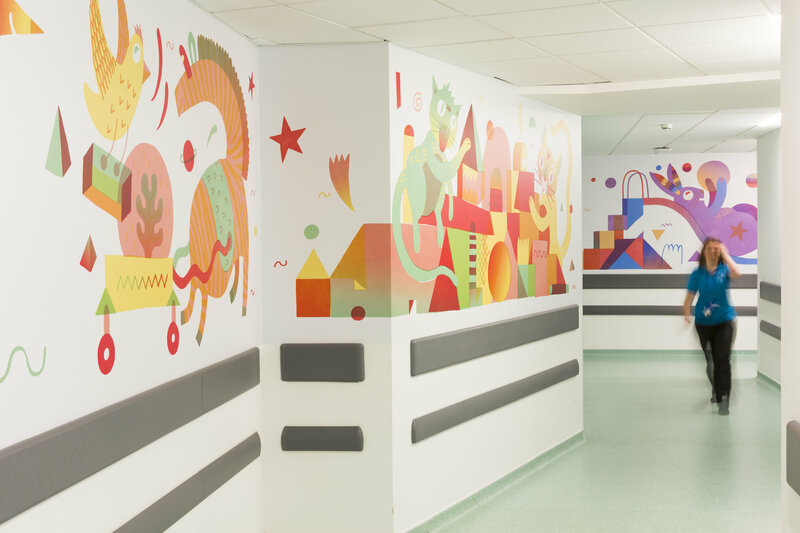 Alongside these works were a series of colourful feature walls, illustrations and sculptural installations for the Paediatric department at Bristol Royal Hospital for Children. Hospital environments for younger patients need careful consideration to create a welcoming, engaging space which will reassure children of different ages. Bristol-based illustrator Dave Bain was selected by Willis Newson and commissioned by Wallace & Gromit’s Grand Appeal and University Hospitals Bristol NHS Foundation Trust to create an artwork to define a second entrance to the hospital at the rear of a new extension; along with a series of illustrations on vinyl for the walls of a new link corridor that connects the second entrance to the burns unit. Local sculptor Pete Moorhouse worked on the external entrance artworks with Dave Bain to help him realise his designs from 2D illustrations to 3D installations. The works, entitled ‘Life is a playground’, aim to create a vivid and entertaining visual journey that leads visitors through the building. The scenes of adventure and play are animated by a host of animal characters that reappear at intervals and serve as familiar faces throughout the space. Life is a playground is part of a wider programme of artworks managed by Willis Newson as part of the refurbishment and extension of the children’s hospital, which also includes a number of commission for specific departments within the hospital. This includes ‘Hide and Seek’ by Edwina Ashton, a series of artworks printed onto vinyl and di-bond panels in HDU rooms, burns inpatient bedrooms and bathrooms. The beautiful illustrations show magical creatures on a great balloon race as well as other adventures. Alongside this are sculptural wallworks by Marta Mace, Sinta Tantra and Seamus Staunton. The artworks were funded by the hospital's charity Above & Beyond’s Golden Gift Appeal which is raising funds for the creation of a calming, uplifting and supportive environment for patients, visitors and staff through artworks to enhance the redevelopment of Bristol Royal Infirmary. Images by photographer Max McClure & artist Dave Bain.